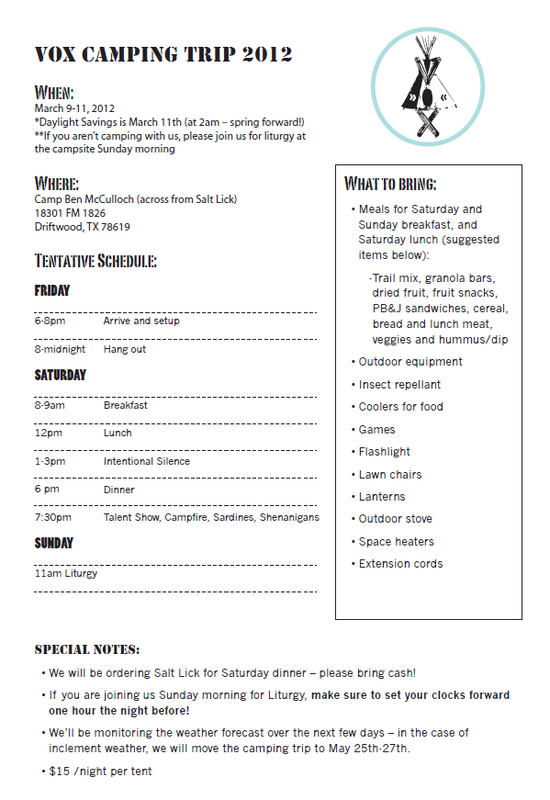 Join us for our second attempt at our first inaugural camping trip! BYO-everything. Hang out, spiritual direction, sardines and a talent show are on the table. We will be having our Sunday liturgy at the campsite, so join us Sunday morning even if you’re not planning to camp. The Google spreadsheet has tabs for those interested in biking with us to Camp Ben, carpooling, participating in the talent show, helping setup, sharing of outdoor equipment, suggested food items and any other miscellaneous items you’d like to bring and share! You can download the flyer below, just note that the dates are now May 25-27th! No time change, but all other details still hold true. Send Elaine an email if you have any questions. Finding ways for our lives to intersect. We can do more together than we can do alone. Whether it's CARE TEAM or SHARING, we are the Church.